Jim Fosgate made a discovery while working in his garage in 1973. He realized music and the human ear have different audio properties. He discovered the human ear didn’t have the same sonic curve or signature as music. This leads to lower frequencies at soft volumes sounding different than the actual music. From this discovery Jim Fosgate and his friends spent days and nights engineering the perfect sound equipment for consumers. The timeline of innovative products began with the PR-7000 amplifier. Shortly after its success, Fosgate introduced the Punch and Punch Power brands to create sound quality that was never experienced before. The prime speaker series kept the original essence of the brand when it was first introduced. It has, however, improved with time to keep up with demanding trends. 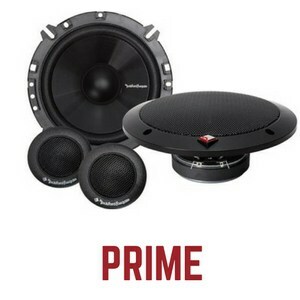 Prime speakers are the perfect replacements for most cars’ factory speaker systems. All speakers listed under the Prime series have vacuum polypropylene cones. The cone shape is quite important for sound systems because it delivers directivity and suppression of resonance. The speakers are either two-way components or full-range speakers. The Punch series speakers deliver the music power you want. 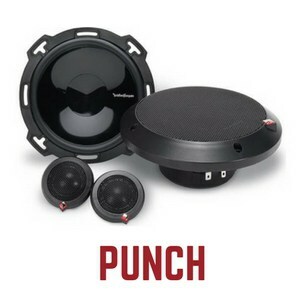 All speaker systems under the Punch series have the design and technology to deliver optimum sound performance. The Punch series is perfect for those audiophiles who want to “feel” rather than listen to music. The Punch speakers have the handling power and sensitivity range to guarantee sounds are rich and clear with no distortion. The type of speakers can be full range or component. It can also be two or three way. Two way coaxial versions are also available. The top-class speaker system is a collection of components and two-way type speakers. The Power speaker systems deliver a new world of sound elevation in greater accuracy and clarity. You’ll never miss a beat or sound range with the Power series. 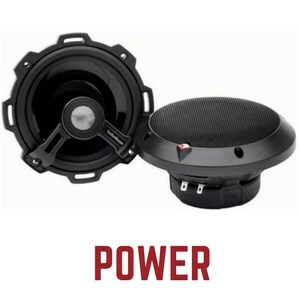 The Power product range exceeds most of the handling power to deliver the sound expectation. The design of the speaker and the rubber surround work together to push amplified and clear sounds. The speaker systems arrive with a full set of sound equipment with the relevant hardware. The Rockford branded hardware shows parts are genuine. The parts work together to deliver optimum quality sounds. A division of the Punch series the P165-SE has the power to boost your car’s sound system. The unique use of the injected molded mineral filled polypropylene cone delivers accurate sound. The signature Vertical Attached Sound Technique (VAST) expands the surface of the cone to amplify the bass response. At high volumes when the bass gets heavy the speaker still provides a full range of sounds without distortion. The P165-SE has an updated external crossovers design. The new crossovers will deliver smooth high, lows and mids. These speakers can fit well into European made cars such as Volkswagen and Citroen. Instead of using screws that may not fit, the P165-SE features a slot design on the outer edge of the speaker. Included in the package is the hardware and instructions to help you install the speaker. The dome tweeters are made with polyether imide, which is a polymer film that produces superior sounds. The Punch P1683 follows a butyl rubber surround which dampens unwanted distortion. Weather conditions won't affect the sound performance of the speakers. This contributes to less distortion, superior frequency response and durability. The three-way speakers are embedded with VAST surround. This feature increases the speaker’s effective radiating cone area by up to 25%. The Multi OEM adapter allows you to connect the speaker to most OEM opening. This increases the possibility that the speaker will fit into your vehicle. The unique Flexfit slotted design also increases the possibility of a perfect fit. The built-in Integrated Concealed Crossover (ICC) decreases and simplifies the installation time because the passive crossover is hidden. The kit arrives with two woofers which are mineral filled, injected molded polypropylene. This gives the speaker’s cones the uniform thickness they need. The thickness contributes to the superior impedance Ohm and clarity. The woofers are also lightweight yet sturdy for decreased distortion and improved sound bass. Each speaker also has two tweeters made from polyether imide materials. The materials boost sounds for a wide soundstage. Is your factory sound system not powerful anymore? Replace it with the Rockford Fosgate P1462. This two-way speaker system will be an instant improvement giving you back the music joy you love. The Fosgate P1462 features two speakers with OEM adapter plates. These plates make it easier for you to fit the speakers into your car’s OEM opening. They make it possible to fit a variety of cars. This speaker system also implements the Flexfit design. The frame utilizes slots instead of screw size holes. Not every car uses the same size screws. Slots are standard for most cars; this leads to no disappointment because the speakers can be a perfect fit. The ICC conceals the crossovers inside the speaker’s basket. This contributes to a cleaner look and also easy installation. The VAST surround found again in this speaker series increases effective radiating cone area by 25%. The size of the basket remains the same even though the cone increased. This ensures the full coaxial speakers can fit into most vehicles. The butyl rubber surrounds contributes to no distortions. This remains the same for all weather conditions which leads to ultimate frequency response and durability. This 3.5’’ two way coaxial speakers are great replacements for your factory surround systems. The 40W peak power drives rich and full sounds without distortion. There is no need to install other sound systems to amplify sounds. The Flexfit and OEM adapter plate allows the speakers to fit into most vehicles. The Punch P132 can fit into Europeans cars too. The injection-molded polypropylene design makes the speakers thick enough to deliver linearity and clarity. The thickness of the speakers won't impact the size making them easier to fit in most vehicles. The 25% increase of the effective radiating cone won't affect the size of the basket either. The tweeter dome has a built in crossover. This lowers the frequencies to produce rich sounds for a wider soundstage. The ICC hides the crossovers to eliminate the need for modifications to make the speakers fit. 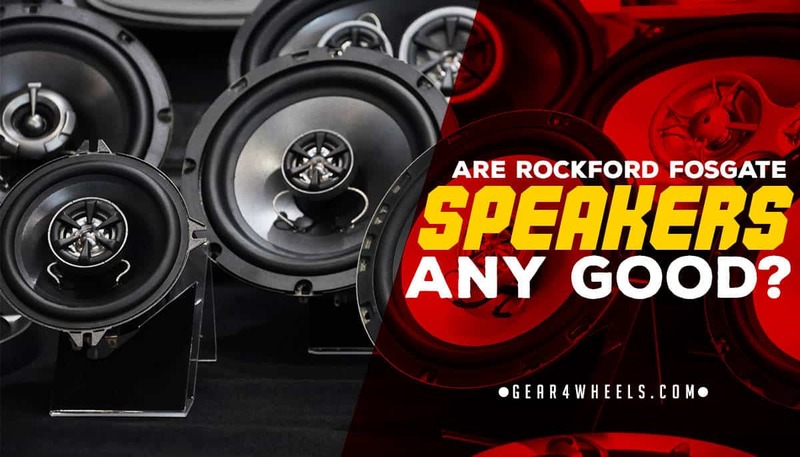 I have delivered a through, honest review of Rockford Fosgate car speakers that will help you to decide which system better fits your audio needs on the go.